Ceana Nezhat, MD, FACOG, FACS, Medical Director of the Nezhat Medical Center, is a world‐renowned surgeon specializing in endometriosis, minimally invasive surgery and other procedures for women. The practice is devoted to providing comprehensive, individualized care in minimally invasive surgery, endometriosis, infertility, fibroids and Hormone Therapy throughout a woman’s reproductive years and beyond. Dr. Nezhat’s lifelong dedication to educate and advance women’s health has earned him numerous distinguished honors and international recognition. Patients travel to Nezhat Medical Center from all over the world for consultations and surgical treatment. As a preeminent authority in the field of Minimally Invasive Surgery, his expertise are highly sought for cases deemed rare, impossible or advanced stages of disease. 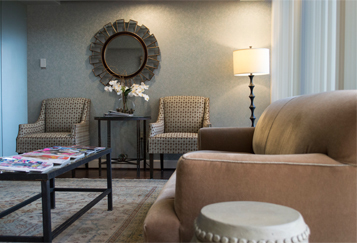 The Nezhat Medical Center Staff is located in Atlanta, GA and comprised of highly qualified health‐care professionals dedicated to maintaining the highest quality of patient care. Our staff is here to ensure your experience at Nezhat Medical Center is a success. Our goal is to provide patients with excellent care specifically tailored to their needs, while focusing on the most beneficial options for one’s overall optimal health. We are happy to answer any questions and assist you in scheduling your initial consultation. Please contact us online or by phone at (404) 255-8778 or (888) 659-2311 during regular business hours. Our office is located in the Medical Quarters Building, Suite 276. There is a pharmacy and café on the ground floor for your convenience. The Medical Quarters sits on the southeast corner of Peachtree Dunwoody Road and Johnson Ferry Road, across the street from Northside Hospital and Children’s Health Care of Atlanta Scottish Rite. Parking is available at the Medical Quarters Building at a flat rate of $5.00. There is no charge for 30 minutes or less. Dr. Ceana Nezhat operates at Northside Hospital, Johnson Ferry Road, which is located one block from our office. Visit Northside Hospital for more information. Please note, prescription refill requests are processed during office hours only. Prior-authorizations are within your insurance company’s discretion and require adequate processing time. Current patients can reach our on-call nurse after hours for EMERGENCIES ONLY by paging (404) 412-1105. Non-emergent calls should be made during regular office hours.